In any season, a ceiling fan helps to keep you more comfortable. On a humid summer afternoon, it’ll create a soothing breeze; on a chilly winter day, it’ll move rising warm air downward to where it can keep you feeling toasty. Nowadays ceiling fans are available in many sizes and styles to suit the needs of any room. The difficulty is in selecting the right one for your needs. Before buying the new fan, make sure the proposed location offers ample space. There must be at least 24 inches between the tip of the fan blade and nearby wall, and for safety the bottom of the fixture must clear the floor by at least 84 inches (7 feet). There should also be a minimum of 12 inches between the top of the blades and the ceiling. Three different basic installation configurations you should consider are: downrod, next-to-ceiling, and duo-mount. The downrod is the traditional style and incorporates an 8-inch (or longer) downrod from the ceiling to the top of the fan motor. This design is tailored to rooms with high ceilings--those over 8 feet. The next-to-ceiling style is for ceilings 8 feet high or less to permit maximum safety clearance in rooms that have high traffic. The duo-mount permits a traditional downrod installation or a next-to-ceiling installation. For best results, choose a fan with the right blade span (distance from the tip of one blade to the tip of an opposite blade). 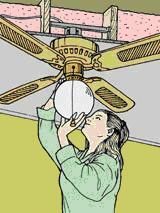 For kitchens, bathrooms, or large closets up to 9 by 12 feet, select a fan with a span of 36 inches. In contrast, small bedrooms, large kitchens, and family rooms up to 12 by 15 feet will need a 42-inch model. Living rooms, dining rooms, large porches, master bedrooms, recreation rooms, and family rooms larger than 12 by 15 feet will need a 52-inch fan to provide adequate cooling. The number of fan blades is also important in your ceiling fan selection. Many fans have four blades; others have five or six blades. The additional blades permit a smaller fan to produce air movement similar to that of a larger fan. For example, a smaller fan with more than four blades is about equal to a larger fan with four blades. Ceiling fans also vary in the way they are installed. Some will be wired to wall switches to control fan speed and light, while others will be in line with other electrical fixtures. In some cases, you may instead want to use a surface wiring system, or a swag kit. In addition, before installing a fan, make sure that the ceiling box is approved by the National Electrical Code (NEC) and that the fan will be attached to a brace capable of withstanding the weight and vibration of the fan. If you are not comfortable with any aspect of installing the fan, hire a licensed electrician to do it for you. The instructions below are for replacing an existing ceiling fixture with a ceiling fan whose light will be controlled by a wall switch and the fan by a pull chain. Use them as a guide while following the instructions that accompany your fan. First, turn off the power at the electrical service panel to the circuit for the ceiling fixture. Next, remove the existing fixture and disconnect the wires. If the existing electrical box and hanger are not the types approved for use with a ceiling fan, remove them. Wear safety goggles to protect your eyes from any dust or insulation that may fall from the ceiling. To remove the box, first unscrew its center fastener and cable clamps. Temporarily displace the insulation found near the box and bracket. (For blanket insulation, use a stick or wire to prop up a tent over the area. It can be pulled down after the new bracket is in place.) Use a small hacksaw to sever the old lightweight support bar and then bend the bar out of the way. 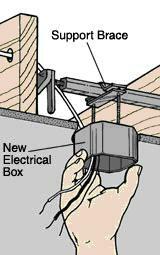 Install an adjustable support brace and a metal electrical box recommended for use with ceiling fans. The support brace should be able to hold the weight of the fan; the box should be NEC approved for use with ceiling fans. Feed the new adjustable support brace into the cavity along the direction of the joists. Then rotate it 90 degrees so that its center bar spans crosswise in the cavity and the feet rest on the ceiling board. Turn the bar of the support on its axis, allowing the bar to lengthen until both ends are securely set into the two joists. Follow manufacturer’s directions for assembling the fan and mounting the fan onto the bracket, feeding the fan wires through the downrod, and connecting the wiring to the appropriate fan and light wire leads. 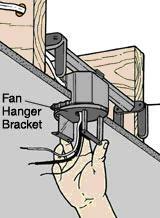 Note: Many fan models have a built-in installation support hook on the fan hanger bracket that enables you to hang the fan motor while you attach the wires. Without the support hook, you’ll need a helper to hold the fan motor while you connect the wires. Attach the light or cover plate (Fig.3). Turn power back on to the circuit.